Have you ever borne the ignominy of being the last one in the line? Or rather the question should be: how often have you gone through the process of being the last one in the line? How often did you end up being the last one to cross the line in a race? And add to these situations, all those occasions when you scored next to nothing in school examinations and barely managed to stay abreast with the rest of the class. And society does not stop judging you here. There are still a number of places left where an individual can be graded and classified. It judges you in terms of the salary you are earning, how big or small is your car, how big or small is the place you live in. And then it places individuals in a line, a hierarchy. 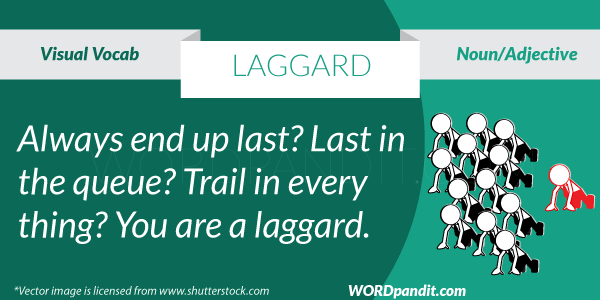 In case you find yourself in the bottom end of all or any of the situations above, you are labeled a laggard. The last in any line, actual or figurative, is a laggard. 1. The organization must firmly tackle the laggards who are not performing up to the level. 2. The main laggard was the consumer goods wing for Samsung, and despite the sales of its mobiles phones, the company ended up in losses.